iRecruit’s customers have received an average of 145 new employment applications in the month of March 2019. This down slightly from February 2019 which showed an average 138. 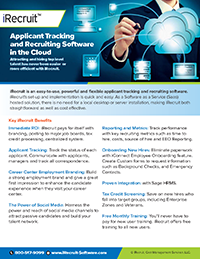 The number of applications by customer typically varies based on the number of jobs posted. This entry was posted in Blog, iRecruit Blog and tagged iRecruit Average Number of Employment Applications March 2019. Bookmark the permalink.